The Savior said, “All natures, all formed things, all creatures exist in and with one another and will again be resolved into their own roots, because the nature of matter is dissolved into the roots of its nature alone. He who has ears to hear, let him hear.” [cf. Matt. 11:15, etc.]. 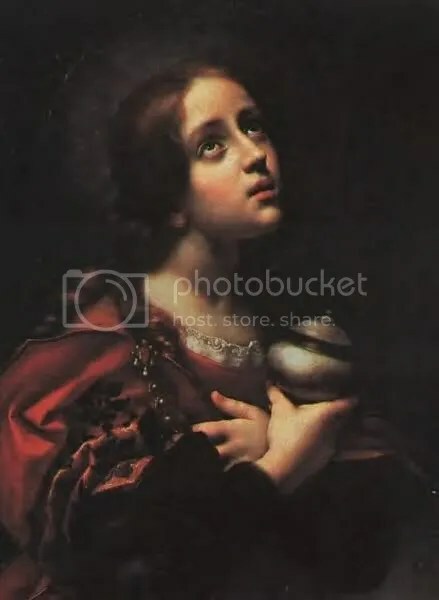 Then Mary stood up and greeted all of them and said to her brethren, “Do not mourn or grieve or be irresolute, for his grace will be with you all and will defend you. Let us rather praise his greatness, for he prepared us and made us into men.” When Mary said this, their hearts changed for the better, and they began to discuss the words of the [Savior]. Levi answered and said to Peter, “Peter, you are always irate. Now I see that you are contending against the woman like the adversaries. But if the Savior made her worthy, who are you to reject her? Surely the Savior knew her very well [cf. Luke 10:38- 42]. For this reason he loved her more than us [cf. John 11:5]. And we should rather be ashamed and put on the Perfect Man, to form us [?] as he commanded us, and proclaim the gospel, without publishing a further commandment or a further law than the one which the Savior spoke.” When Levi had said this, they began to go out in order to proclaim him and preach him.